Nov. 28, 2018 — IQUIQUE, Chile — A U.S. Air Force hydrazine Mobile Training Team traveled to Los Condores Air Base, Chile, to conduct classroom instruction and hands-on training with Chilean Air Force fuels technicians Nov. 5-16, 2018. The two-man team taught seven Chilean fuel Airmen how to properly assemble, operate and maintain their new hydrazine servicing stand. The stand is used to refuel and defuel, purge, and prepare a shipment of hydrazine tanks. Hydrazine is a back-up fuel used in F-16 Fighting Falcons that allows a pilot to regain control in the event of an electrical or hydraulic failure. When the hydrazine is released it creates a chemical reaction that allows the pilot to manually maneuver the aircraft in order to land it safely. “For us, this exchange is very important, because we can develop and exchange experiences from other Air Forces, specifically the United States, which we have worked with for many years” said Chilean Air Force Chief Master Sgt. Sergio Alejandro Espinoza Marin. The Chilean Air Force requested the Hydrazine MTT to refresh their Airmen’s knowledge and understanding of a hydrazine servicing stand and servicing hydrazine tanks. Due to environmental conditions their previous hydrazine servicing stand became corroded and unserviceable. Salazar was hand selected to the lead the training with the Chilean Airmen because of his expertise and experience with hydrazine in the U.S. Air Force. He is the hydrazine program lead at Luke Air Force Base, Arizona, and has serviced more than 100 hydrazine tanks in his five-year career. Throughout the two weeks Salazar instructed and observed the Chilean Airmen as they prepared unserviceable tanks for depo, replaced parts on tanks and refueled tanks. In-between hydrazine training the Chilean Airmen had real world fuels concerns to address and requested Salazar’s expertise in troubleshooting the issues. “The opportunity to share our knowledge and your experience is one of the best parts for us” said Chilean Air Force Lt. Enzo Garlaschi Arenas, maintenance officer in charge. 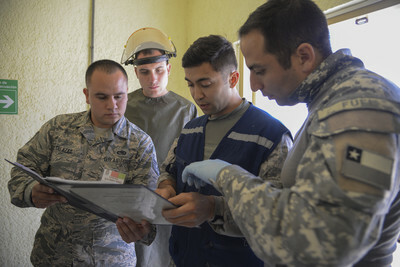 The Chilean Air Force fuel Airmen read English technical orders but don’t often have the opportunity to practice speaking English. The hydrazine MTT instructed in English and had limited Spanish interpretation since only one of the team members was fluent in Spanish.